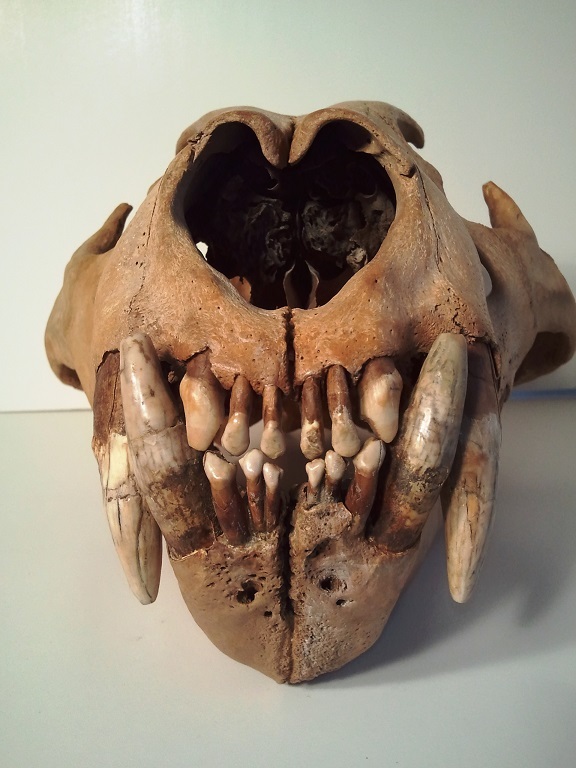 Item rating and description: 1-10 10 WOW Rarer than Smilodon Largest US Pleistocene Predator Ever Giant American Lion Left Jaw ( 10”x 5” High )with all Teeth Inc. Canine except smaller premolar probably lost during its life . 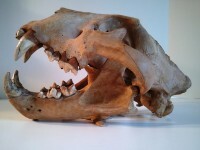 This jaw is amazing with no restoration of any type found in a Gold Mine . The canine is around 3” long with more root under the jaw. I can’t see any flaw in this jaw. It’s a beautiful reddish-brown . With my desire for only the extreme rare ITEMS , I have to admit this is so awesome I went beyond the usual. This is a huge find, and I’m one of only a few to have had even one of these. In fact I’ve sold many but this is oneof my best ever. This one is so special as it has never had the teeth out of the sockets as most are placed in from other cats to make complete. . It hasn’t been restored at all . The canine is so original nothing has been done to even seal the fine cracks down the tooth. Perfect with all teeth perfect , and I don’t even see wear . It was protected by the Yukon permafrost for at least 10,000 years. 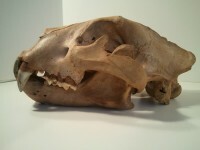 This animal is much rarer than Smilodon which complete skulls if you can find one go for close to $100,000. You get one quarter of the animal for not much compared to this. IM just amazed to have such a jaw from the same animal with all teeth intact after maybe 50,000 or more years . .This is a great investment . I used to sell these for 7500 at least . This one is worth much more than this but I sell under retail as much as I can. As a true cat lover I can’t resist it . 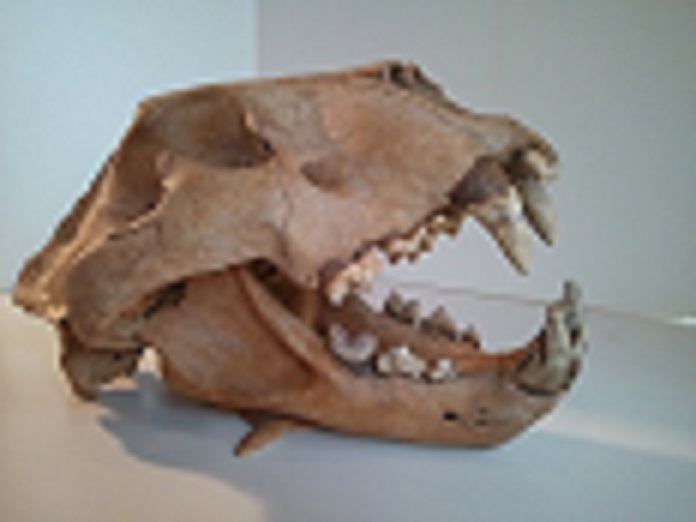 Species description: Extinct Large Species of Lion from 370,000 to 10,000 years ago <. It was one the largest carnivores at that time except the Giant short –faced bear which are virtually nonexistent in the fossil records . It was much larger than the Smilodon Saber-tooth cat or the modern Lion , It had rounded protruding ears , tufted tail, and perhaps faint tiger-like stripes .They lived at same time of Neanderthals (250,000-30,000 ) and Cro-Magnon man( 40,000-10,000) They were featured in Paleolithic religious rituals and they were hunted by a form of human . Mostly found in Europe but this one and some are found in Russia , Siberia and Alaska .This was up to 20% larger than the largest lion today . 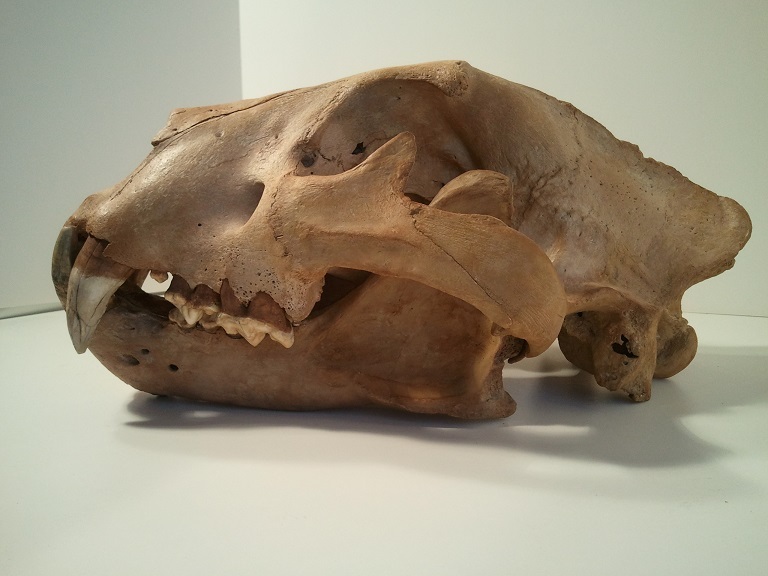 Species description: Extinct Large Species of Lion from 370,000 to 14,000 years ago. 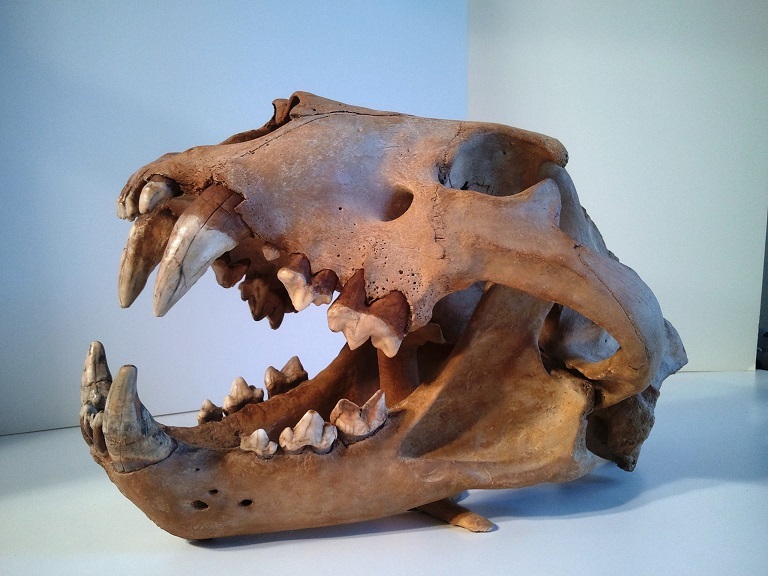 It was one the largest carnivores at that time but this species was smaller than other Eurasia Lions and the rarest .and are virtually nonexistent in the fossil records . It was still larger than Smilodon Saber-tooth cat. , It had rounded protruding ears , tufted tail, and perhaps faint tiger-like stripes .They lived at same time of Neanderthals (250,000-30,000 ) and Cro-Magnon man( 40,000-14,000) They were featured in Paleolithic religious rituals and they were hunted by a form of human . Mostly found in Europe but this one and some are found in Siberian Russia, now Kazakhstan and Alaska . This speciesis rarest of all extinct lion species by far even though recently 2 lion cubs with skin and hair were found complete with DNA in Russia in 2015 . This species is of great scientific value as due to color these may have been the original cave lion. 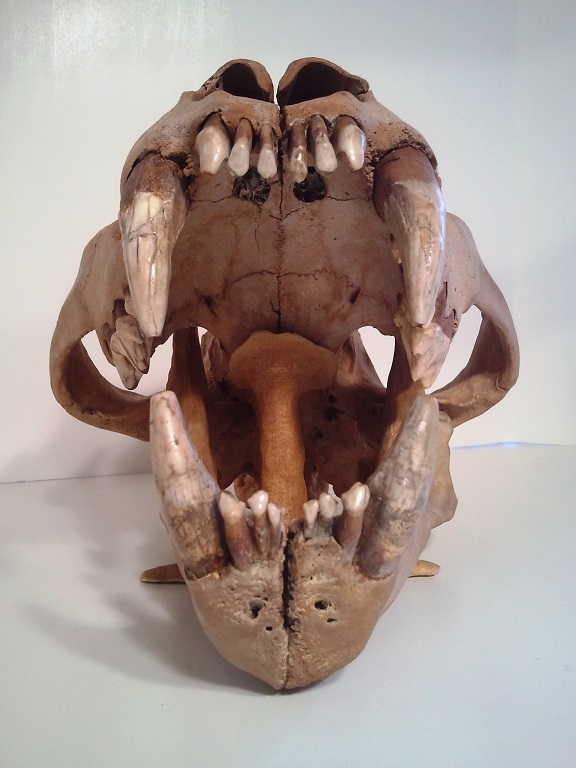 Item description: 1-10 9.8 Amazing Lower canine of the rarest extinct lion 3.5 “ Lowers are smaller . There is wear on tip a lot but it isn’t broken. NO work has been done on this as it’s 100% natural . This is my first of this species. Just a short time ago this species was only thought to be in Russia Siberia, and high in Alaska close to Bering Straight. However for first time they are finding in Kazakhstan on private lands in caves. This no one has as I know everything on lions, and never before this year saw this species. IM getting a whole skull soon but it’s from Russia. How I know they are same it’s the smallest species of lion due to coldness as Eurasia Lion went in 2 forks –one American Lion once it hit Alaska, and these Beringia lions. I’ve only seen 1 Bering1a Lion skull ever and I bought it. It’s of exceptional quality .Total natural makes this piece a must for a collector or even a beginner as it so reasonable on price. This is from an animal that is hardly found in the fossil record. These are rarer than Smilodon bones by far as I had many Smilodon. Keep in mind no one has anything of this lion species except me.